The new Revolution lines are an innovative product that I have been making for some time. They consist of a perfect mix of the qualities of natural silk and artificial silk. In fact, these lines are smooth and compact like my artificial silk lines and at the same time they are strong and resistant like the lines braided with natural silk. They are available in various colours so that they can blend in and be almost invisible for the fish and yet remain well visible to the fisherman so that he can follow his cast and his presentation. Many of the fishermen that choose these lines, do like silk lines but they regard natural silk to be too delicate. In these lines they find a great resistance to temperature changes, to UV rays and even salt water. The material with which they are made of gives them many appreciated qualities. 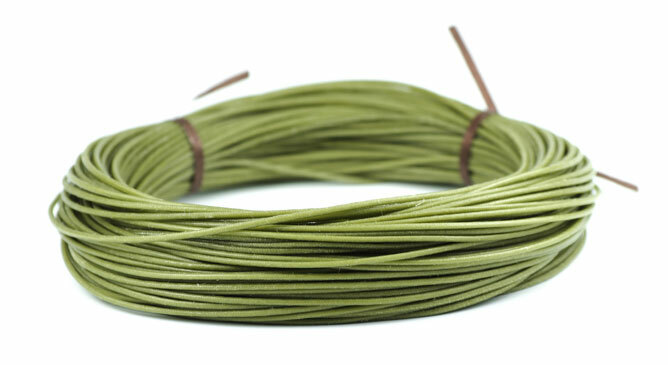 The artificial Revolution silk lines have a slight elasticity that helps when you are setting the hook of big trout. The innovative “CaptivAir” system traps the air and gives them the right specific weight with respect to industrial lines which are made under vacuum. Being hand-made, they can come in different sizes, profiles and weights, which are not usually available on the market, so I can tailor-make the lines to the requirements of the fisherman. If you want to try something new, that is not available on the market, the Revolution lines are the lines for you. In the packet you will receive two leaders and a container of line dressing specially formulated for these lines, which you will use only rarely because they require very little maintenance. Order your Revolution line now, choosing from the vast range of standard lengths and weights or order your personalized line.